This article was written for the Statesman Journal and published September 2014. It is reproduced here for reference purposes. C.P. 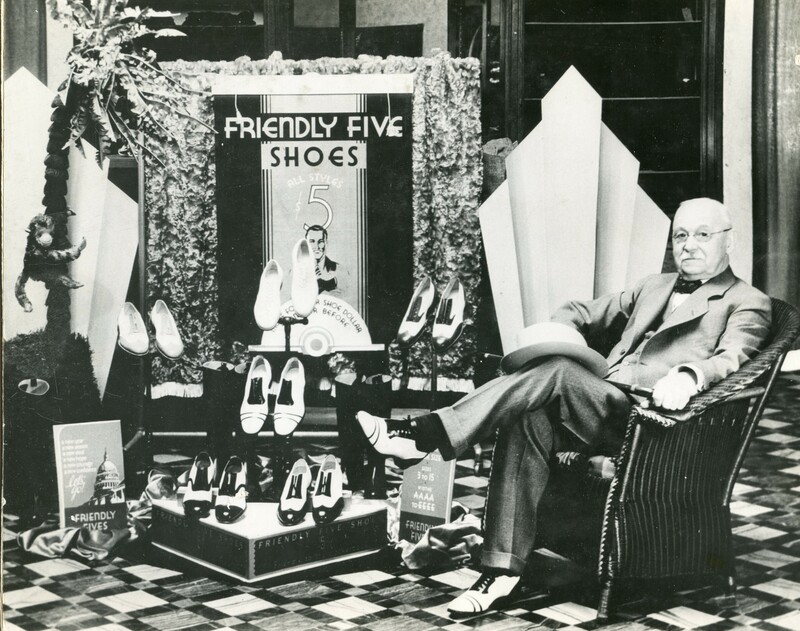 Bishop sitting in the $5 shoe display in his store. Salem in the early 1890s was a thriving community with high hopes for the future and enterprising men to make it a reality. On May 1, 1891 one such young man, Charles P. Bishop took over the Salem Woolen Mill store at 299 Commercial St. The energetic, ambitious son-in-law of Thomas Kay was already a founding director of the Kay Woolen Mills with a background in merchandising including previous work experience and ownership of stores in Brownsville, Crawfordsville, and McMinnville. When the opportunity presented itself to purchase the Salem Woolen Mill store from his father-in-law he did so, for $20,000. Charles Pleasant Bishop was born September 23, 1854, in Contra Costa, California to the Reverend William and Elizabeth Jane Adams Bishop. By the age of 20 he was clerking in the store of Kirk & Hume in Brownsville, Oregon. Two years later he changed employment, accepting a position as clerk and salesman at the Brownsville Woolen Mills store. In 1874 Charles attended a July 4th celebration with Fannie Kay, the daughter of Thomas Kay, manager of the Brownsville Woolen Mill. He later recalled, “After going to the Fourth of July celebration I could no longer say I didn’t have a girl, for Fannie and I began keeping company.” They were married on October 8, 1876. It was the perfect marriage of textile manufacturing (Fannie) and merchandising (Charles). Fannie had grown up assisting her father at the mill and knew the business inside and out. 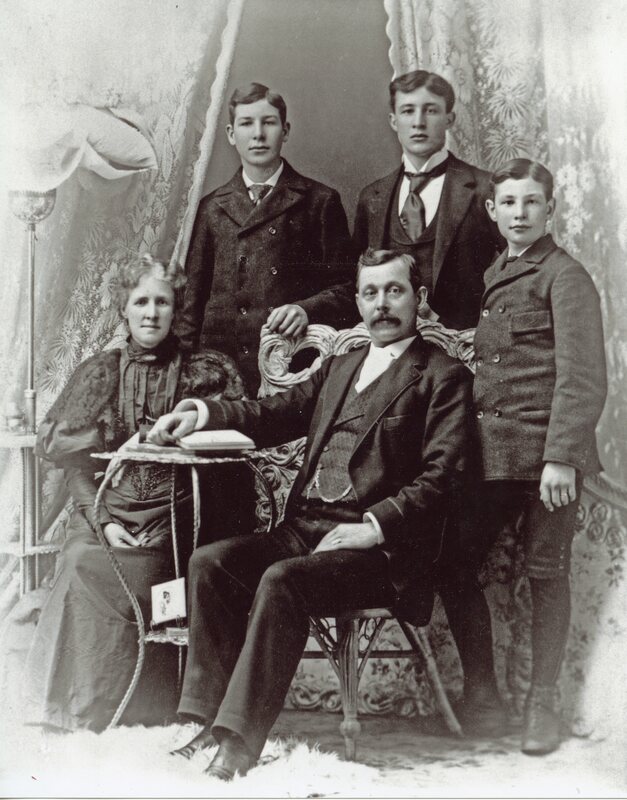 In rather quick succession, three sons were born to the couple; Clarence M. Bishop in 1878, Royal Thomas Bishop in 1881, and Robert Chauncey Bishop in 1882. The original Salem Woolen Mill Store purchased by Charles, or C.P. as he preferred to be called, was located at 299 Commercial St., between Court and State streets. It was a two-story structure measuring about 30 by 40 feet with a floor space of 22 by 60 feet. The store employed two clerks, H.S. Belle and William Woodsworth. The first few years were difficult following the Panic of 1893, but the economy improved following the turn of the century. In November 1896 the first worsted cloth manufactured west of the Mississippi River came off the looms of the Kay Mill. A forty-yard bolt was placed on display and for sale in the Salem Woolen Mills store. Owner C.P. Bishop immediately cut off three and one-half yards of the blue serge and took it upstairs to the tailor shop to be measured for a suit. The rest was advertised as $25 a suit. In 1899, C.P. was elected mayor of Salem and would continue to serve until 1906, successfully juggling political office, the running of the Salem store including several expansions and a move in 1902 to larger quarters at 136-138 Commercial St. where the parking lot north of Spaghetti Warehouse restaurant is now located. In the spring of April 1900, events began to take place that would shape the family business and future, beginning with the death of Fannie’s father, woolen mill owner Thomas Lister Kay. Despite the years Fannie had spent at her father’s side running the mill, her brother Thomas B. Kay was chosen and elected president and general manager. Shortly thereafter C. P. resigned as a director in the business, though he and Fannie continued to hold stock in the mill. The Bishop’s store continued to stock the products of the Kay mill, especially blankets which were always sold under the mill’s label. In addition to the Salem store, C.P. also owned the Salem Woolen Mills Store at 85 Third Street in Portland where C.T. Roberts, Bishop’s brother-in-law, was manager. Here, as in the capital city, the Kay fabrics and blankets were stocked and tailoring departments were maintained. In 1908, the Bishop family took a huge leap of faith and purchased the defunct Pendleton Woolen Mill in Eastern Oregon. A business opportunity for enterprising young sons, a guaranteed future supply of woolen goods for their rapidly growing retail outlets, and the chance to build a family legacy. Two sons, Charles and Roy, were sent to oversee the project. Chauncey, the third son remained to help his father run the Salem store. The 1920-1930s were an era of growth for the family business despite the Great Depression. The Salem store grew to employ 18 full-time employees. The store moved again, this time to the Eckerlen Building at 145 Liberty St. At 8,000 square feet with two floors, this was nearly ten times the size of the original store. The name was changed to Bishop Clothing and Woolen Mill Store and the business, originally operated as a sole proprietorship, was incorporated in 1924 and sold to the Bishop sons and R.H. Cooley, longtime employee and manager. For many decades Bishop Clothing was recognized as one of the West’s finest stores for men as C.P. Bishop continued to pour his energy and ambition into the business and established policies that guided its management. He saw it through difficult years and onto a firm footing that would last into the early 1980s when the store was closed. This entry was posted in History Tidbits, News from the Past and tagged 136-138 Commercial St., 299 Commercial St., Brownsville, Charles P. Bishop, Clarence M. Bishop, Crawfordsville, Eckerlen Building, Fannie Kay, McMinnville, Pendleton Woolen Mill, R.H. Cooley, Robert Chauncey Bishop, Royal Thomas Bishop, Salem Woolen Mill, Thomas Kay Woolen Mill. Bookmark the permalink.